All pets deserve a clean place to live, free of rotting food, feces buildup and dangerous bacteria. At the same time, however, cleaning a cage or tank can be stressful and unnerving for a pet reptile, so it is important to limit cleaning frequency to minimize that stress. But how often is too often or not often enough for your reptile's habitat? Fortunately, cleaning a reptile's habitat doesn't have to be an unreasonable chore, especially if it is done with the proper timing. Exactly how often it is necessary to clean a reptile's tank or cage will vary based on a number of factors. A larger, more active reptile will need more frequent habitat maintenance, while a smaller pet in a large, spacious tank may not need habitat cleaning nearly as often. The reptile species can also affect how often the habitat needs cleaning – corn snakes or milk snakes are generally much lower maintenance than iguanas or turtles, for example. Whether you have a snake, lizard, turtle or tortoise, however, all reptiles need clean, healthy habitats to enjoy. Every day, certain easy steps can be taken to keep your reptile's habitat clean without stressing your pet. Food and water dishes should be cleaned and refreshed, and uneaten food should be discarded. Spills can be wiped up, and obvious feces or shed skin can be removed before it creates a dirtier environment. These are quick tasks that won't generally disturb your pet, but will help keep its environment clean and comfortable. A more thorough cleaning once a week is sufficient for most reptile habitats. At this time, all the habitat surfaces should be wiped carefully with an appropriate disinfectant, and any rocks or wood should also be wiped down. Decaying plants should be removed, and any other toys or fixtures should also be wiped and cleaned. Dirty substrate should be replaced. To accomplish this cleaning, your pet should be temporarily removed from the habitat so it is less disturbed by your activities. A very deep cleaning can be done once a month, though it may not even be needed this frequently for some reptiles. For this cleaning, everything should be removed from the habitat and all surfaces scrubbed, including getting into corners with a toothbrush. All substrate should be changed, and wood, rocks and feeding dishes should be thoroughly soaked in disinfectant or replaced. Allow the enclosure to thoroughly dry and air out until no cleaning fumes remain, which could take several hours. This is also a good opportunity to add new toys or rearrange the habitat to provide better mental stimulation for your reptile. During this time, your pet will need to be in a safe, temporary home until it can be returned to its newly cleaned and refreshed habitat. 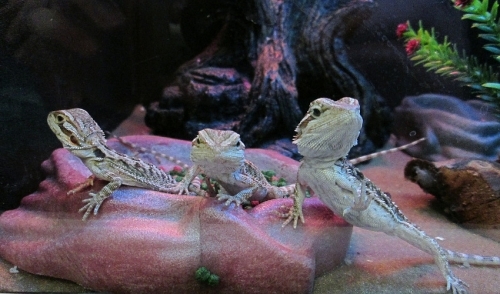 Cleaning your reptile's habitat is an essential part of owning and caring for one of these marvelous pets. Understanding the proper timing and cleaning tasks can help you give your reptile a clean, comfortable home without excessive stress or disturbance.